Demonstrations of how we can help companies are more powerful than just talking about theoretical cases. In a recent example case, we had a prospect that was looking for a more stable facility than the selective invoice finance facility that they had used sporadically, from one of the single invoice finance providers. This problem that they had experienced was that their selective invoice finance facility had been frozen, when a CCJ was registered against their company, and in addition they had entered into a TTP (Time To Pay) arrangement with HMRC due to this CCJ. The customer felt that the funder had communicated very little with them when this had all happened, and so they wanted a more sympathetic provider that would work more closely with them, and help get them through these temporary cash flow problems. 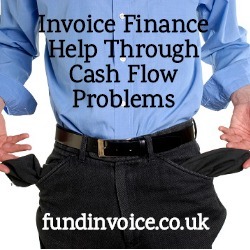 There are invoice finance companies that specialise in helping customers that are in such situations where they have pressing creditors and HMRC arrears. In fact, this type of facility can be a lifeline even if you are facing insolvency. Getting a facility in place could prevent your company from becoming insolvent as it will enhance and improve your company cash flow. We explained how you can still get receivables finance despite having court judgements in a recent blog post. We also explained some steps that may help you improve your credit situation and business funding you can access in the interim. We have introduced them to a provider that will both fund the UK and export elements of their sales, despite the recent CCJ and the TTP arrangement. As I have said many times before, the approach or funders to issues like court judgements and tax arrears varies between different providers. Some are far more sympathetic than others that take a very strict view, and will not risk involvement with a business that has such creditor pressure. A TTP or "Time To Pay" arrangement is an installment plan, agreed with HMRC to allow you to repay outstanding tax over a period of time. This is normally up to 12 months, but can be longer in some cases. It is based on affordability and takes into account your circumstances (often a cash flow forecast will be required to evidence your ability to meet the repayment schedule). You can negotiate directly with HMRC, or there are various intermediary organisations that will offer to do it for you. Once agreed, HMRC will stick to the arrangement unless your circumstances change, or you default on payments.